Individuals with psychopathy are often characterized by emotional processing deficits, and recent research has examined the specific contexts and cognitive mechanisms that underlie these abnormalities. Some evidence suggests that abnormal features of attention are fundamental to emotional deficits in persons with psychopathy, but few studies have demonstrated the neural underpinnings responsible for such effects. Here, we use functional neuroimaging to examine attention–emotion interactions among incarcerated individuals (n = 120) evaluated for psychopathic traits using the Hare Psychopathy Checklist–Revised (PCL-R). Using a task designed to manipulate attention to emotional features of visual stimuli, we demonstrate effects representing implicit emotional processing, explicit emotional processing, attention-facilitated emotional processing, and vigilance for emotional content. Results confirm the importance of considering mechanisms of attention when evaluating emotional processing differences related to psychopathic traits. The affective-interpersonal features of psychopathy (PCL-R Factor 1) were associated with relatively lower emotion-dependent augmentation of activity in visual processing areas during implicit emotional processing, while antisocial-lifestyle features (PCL-R Factor 2) were associated with elevated activity in the amygdala and related salience network regions. During explicit emotional processing, psychopathic traits were associated with upregulation in the medial prefrontal cortex, insula, and superior frontal regions. Isolating the impact of explicit attention to emotional content, only Factor 1 was related to upregulation of activity in the visual processing stream, which was accompanied by increased activity in the angular gyrus. These effects highlight some important mechanisms underlying abnormal features of attention and emotional processing that accompany psychopathic traits. Psychopathy is a personality disorder characterized in part by impulsiveness, callousness, and a manipulative, self-serving interpersonal style, combined with persistent antisocial behavior throughout the life span (Cleckley, 1941; Hare, 1996). Prototypical psychopathic behavior includes a chronic disregard for the rights of others and a lack of empathy, despite normal to high intelligence and a charming demeanor. The current standard for measuring psychopathy is Hare’s Psychopathy Checklist–Revised (PCL-R, Hare, 2003). The PCL-R distinguishes among several psychopathic features, including affective (e.g., shallow emotions), interpersonal (e.g., superficial charm), lifestyle (e.g., irresponsibility), and antisocial (e.g., poor behavioral controls) elements, treated as dimensional characteristics (Hare & Neumann, 2005). These elements are commonly organized into two overarching factors (Hare, 2003) representing emotional/interpersonal features (Factor 1) and antisocial/lifestyle features (Factor 2). Etiological models of psychopathy have emphasized the essential roles of emotional dysfunction (Blair, Peschardt, Budhani, Mitchell, & Pine, 2006; Kiehl, 2006) and certain abnormalities in attention (Newman, 1998) in perpetuating these developmental traits. Emotional deficits in psychopathic individuals are long-established in the literature and include poor acquisition of aversive associations (Birbaumer et al., 2005), abnormal affective startle modulation patterns (Patrick, Bradley, & Lang, 1993), and reduced physiological responses to punishment cues (Hare, 1982). However, accumulating evidence suggests that emotional deficits may be contextually limited and modulated by mechanisms of attention (Baskin-Sommers et al., 2011). Early evidence that emotional deficits in psychopathy may be rooted in mechanisms of attention was compiled in the response modulation hypothesis (see Newman & Wallace, 1993). Several behavioral studies indicated that insensitivity to certain motivational cues by persons with psychopathy (i.e., punishment/reward) was limited to circumstances where motivational cues competed for attentional resources with other task-relevant information (Newman & Kosson, 1986; Newman, Patterson, Howland, & Nichols, 1990; Newman, Patterson, & Kosson, 1987). Furthermore, these abnormalities extended to motivationally neutral cues, indicating the primacy of attentional abnormalities, independent of emotional content (Newman, Schmitt, & Voss, 1997). In a developmental context, these attention-based abnormalities would theoretically constrain appropriate engagement with emotionally salient information, resulting in deficits in affective processing, which are apparent even at an early age (e.g., Dadds et al., 2012, 2006). Recent investigations have added support and specificity to this and other attention-based models of psychopathy (for a review, see S. F. Smith & Lilienfeld, 2015). For example, Newman and colleagues have shown that focusing attention directly on threat cues eliminates the classic emotion-modulated startle deficit exhibited in psychopathy (Newman, Curtin, Bertsch, & Baskin-Sommers, 2010). It was demonstrated that this effect occurs during early selective attention, interfering with subsequent redistribution of attentional resources to peripheral (unattended) but salient features of the environment, and has thus been described as an early attention bottleneck (Baskin-Sommers et al., 2011; Baskin-Sommers, Curtin, Li, & Newman, 2012). Emotion-modulated startle effects in psychopathy are also sensitive to perceptual load, reinforcing the bottleneck perspective (Baskin-Sommers, Curtin, & Newman, 2013). Electrocortical measures that accompany emotion-dependent augmentation (e.g., the late positive potential; LPP) show reduced modulation in psychopathy (Baskin-Sommers et al., 2013). Emotion-dependent variation in several other event-related potentials (ERPs) is disrupted in those with high psychopathic traits, and these differences are apparent quite early, within 200 ms following stimulus presentation (Anderson & Stanford, 2012). Furthermore these differences are demonstrably diminished, but may not be completely eliminated by making the emotional content immediately relevant to task performance (Anderson & Stanford, 2012). Larson and colleagues (2013) demonstrated that psychopathy-related reductions in amygdala activity were, as expected, limited to a condition enforcing a preestablished alternative focus of attention (nonemotion focused). This reduction in amygdala activation was accompanied by elevated activity in portions of the lateral prefrontal cortex, thought to represent a functional correlate of the attention bottleneck. That is, healthy individuals are expected to exhibit some disengagement from top-down, executive attention when confronted with emotionally salient information (see Dux, Ivanoff, Asplund, & Marois, 2006; Vossel, Geng, & Fink, 2014). Several focused investigations have thus begun to clarify the role of attention in the emotional-cognitive abnormalities that have long been recognized among psychopathic individuals (see also Anderson, Steele, Maurer, Bernat, & Kiehl, 2015; Kiehl, Bates, Laurens, Hare, & Liddle, 2006; Steele, Maurer, Bernat, Calhoun, & Kiehl, 2016). Still, there remains a great deal to learn about these relationships. Behavioral results have not always been consistent when assessing specific abnormalities in attention in psychopathy, especially in tasks that require dynamic shifts of attentional set (see Blair & Mitchell, 2009; S. F. Smith & Lilienfeld, 2015, for reviews). It has been suggested that attention-based models of psychopathy integrate more closely with contemporary models of attention (Blair & Mitchell, 2009), and more recent attention-based models of psychopathy are making progress by adopting perspectives that embrace network-models of brain function (see impaired integration model; Hamilton, Hiatt Racer, & Newman, 2015). Emotional processing and attention involve overlapping neurocognitive processes, and contemporary models of attention do not make such strong distinctions between the two. A fundamental mechanism of attention is to augment the neural representations of salient stimuli during basic sensory processing (Desimone & Duncan, 1995). Emotion-laden stimuli can achieve a competitive advantage in this process due in part to adaptive pressures impacting safety and survival (Bradley, Codispoti, Cuthbert, & Lang, 2001; Öhman, Flykt, & Esteves, 2001). However, when cognitive resources are otherwise occupied or depleted, this can interfere with encoding of emotionally relevant information (Pessoa, McKenna, Gutierrez, & Ungerleider, 2002; Pessoa & Ungerleider, 2004). Thus, mechanisms of attention often favor naturally salient (emotional) stimuli, but these biases are not impervious to other influences, such as top-down attentional control, individual differences in personality, culture, and pathology (Dadds et al., 2006; Ishii, Reyes, & Kitayama, 2003; Most, Chun, Johnson, & Kiehl, 2006; Neumann, Spezio, Piven, & Adolphs, 2006). Contemporary models of attention have emphasized functional relationships between many brain structures that cooperatively influence the distribution of cognitive resources. These models generally emphasize a competitive interplay between two or more discrete networks that operate independently or show anticorrelated patterns of activation. Perhaps the simplest of these models distinguishes between the default mode network, which is prevalent in task-free and resting-state conditions, and the task positive network, which is engaged during cognitively demanding tasks (Fox et al., 2005). The anticorrelated nature of these large-scale networks reinforces our basic understanding of the fluctuating distribution of limited cognitive resources across varying demands. Functional models of attention that adopt this perspective have identified more specific networks by comparing carefully controlled task-related patterns of activation and disentangling overlapping features of larger networks. One such model differentiates between the salience network and an executive control network (Seeley et al., 2007). The salience network includes the anterior cingulate, fronto-anterior-insula, and subcortical paralimbic structures including the amygdala, comprising many regions commonly associated with emotional processing. The executive control network includes several frontal brain regions important for top-down attention and control including dorsolateral, dorsomedial, and ventrolateral frontal cortex. Components of these networks are capable of augmenting signals in sensory cortex through dense arrays of feedback projections, thus prioritizing certain information by amplifying signals at early stages of processing (Amaral, Behniea, & Kelly, 2003; Pessoa & Ungerleider, 2004; Vuilleumier, 2005). A somewhat different model emphasizes two partially cooperating networks, referred to as the dorsal and ventral attention networks (Corbetta & Shulman, 2002; Vossel et al., 2014). The dorsal attention network governs top-down, voluntary allocation of attention to specific features or spatial locations. It comprises dorsal and lateral frontal regions including the frontal eye fields and dorsal parietal regions, including superior parietal lobule and intraparietal sulcus. The ventral attention network manages responses to unexpected but behaviorally relevant information, such as stimuli with emotional significance. It connects ventrolateral frontal cortex, anterior insula, and regions in the temporoparietal junction (partially overlapping areas identified in the salience network—see also Yamasaki, LaBar, & McCarthy, 2002). The anterior cingulate cortex (ACC) is also a prominent hub in the distribution of attentional resources, especially when competing, motivationally relevant stimuli are involved (Mesulam, 1981; Morecraft, Geula, & Mesulam, 1993). The ACC has been described for its role in directing attention during conflicts in information processing (Botvinick, Nystrom, Fissel, Carter, & Cohen, 1999; Bush, Luu, & Posner, 2000; Etkin, Egner, & Kalisch, 2011). When stimuli compete for attention, the ACC may act as a moderator between the dorsal and ventral fronto-parietal attention networks (Fichtenholtz et al., 2004). Petersen and Posner (2012) have described the ACC together with the anterior insula as a distinct network responsible for control of the dorsal and ventral attention networks. While these and other models of attention continue to be revised and improved, they nonetheless provide us with an informative context from which to study abnormalities associated with psychopathology (see Menon, 2011). 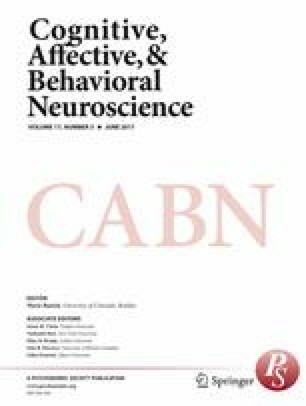 Individuals with psychopathy may fail to benefit from the automatic redistribution of attention that is ordinarily afforded by emotionally salient features of the environment. Yet according to extant models of attention, this failure could theoretically occur in several distinct ways. For instance, when available emotional information is not directly relevant to an ongoing task, one might suspect reduced activity in portions of the ventral attention network, the salience network, or observable downstream consequences in sensory processing areas. Furthermore, given the evident goal-oriented attentional bias associated with psychopathy, it is reasonable to expect abnormalities in dorsal attention/executive networks during appropriate task conditions (cf. Larson et al. 2013), such as when a task explicitly requires the evaluation of emotion. These effects could be further mediated by dysfunction in the anterior cingulate or insula. In short, it is reasonable to suspect that psychopathic individuals may exhibit abnormalities in one, or in a number of networks governing the distribution of attentional resources, depending on the specific goals of an ongoing task (e.g., Hamilton et al., 2015). This study was designed to strategically manipulate features of attention and emotional processing to isolate specific contexts in which functional abnormalities associated with psychopathy can be identified and interpreted with reference to contemporary models of attention. We employed a picture-viewing task with conditions designed to isolate specific features of attention and emotional processing. The design allows for planned contrasts to reveal neural responses associated with implicit and explicit emotional processing as well as goal-directed attention to emotional features for both high- and low-valence (neutral) visual stimuli. These contrasts differentiate between emotional processing per se and attention to emotional content, which may include effects that also vary based on relative affective valence. Functional MRI (fMRI) was used to examine brain areas related to general emotional processing and network models of attention. Based on prior support for attention-based models of psychopathy (Anderson & Stanford, 2012; Baskin-Sommers et al., 2011; Larson et al., 2013; Newman et al., 2010), we anticipated that psychopathic traits would be associated with reduced emotion-dependent activation in brain areas involved in affective processing, but only when emotional content was not relevant to explicit task requirements. We did not, however, expect equivalent activation across participants, even as attention was focused on emotional features (cf. Anderson & Stanford, 2012). We anticipated that attention directed at emotional features would reveal psychopathy-related compensatory activity in regions associated with executive/fronto-parietal attention, in addition to upregulation in portions of the salience network and downstream sensory processing regions. We submit that it is not enough to say that emotional processing differences in psychopathy are accounted for by attention, but that these differences may be clarified even further. If present, these effects would demonstrate with some greater clarity the nature of contextually specific limitations in emotional processing that characterize psychopathy, in addition revealing certain mechanisms supporting abnormal allocation of attention. One hundred thirty-four adult male incarcerated offenders from two Midwestern state correctional institutions were recruited by fliers and by word of mouth to participate in the protocols described here. Meetings were scheduled with interested participants, and informed consent was obtained. Participants were informed of their right to terminate participation at any point, the lack of any direct institutional benefits, and that their participation would not affect their facility status or parole status. They were compensated with an hourly rate commensurate with standard rate for work assignments at their facility. Participants were free from psychosis, bipolar disorder, major depression, and anxiety disorders, and those who met screening criteria for MRI safety participated in the fMRI scanning protocol. Following data collection, 14 participants were excluded from analysis due to failure to complete the protocol, excessive movement during data collection, or poor coverage of the whole brain. Data from 120 participants were retained for final analysis. Participants ages ranged from 19 to 57 (M = 32.9; SD = 7.7). Participants self-identified race: Caucasian/White (n = 71), African American/Black (n = 45), and Native American (n = 4). No participants identified themselves as Hispanic. Among the 120 participants, an adequate range of psychopathic traits was observed: n = 43 participants met clinical diagnostic criteria for psychopathy (PCL-R total score ≥30); n = 41 had scores between 20 and 29; n = 36 had scores below 20. Additional sample characteristics related to clinical assessment measures are provided in Table 1. Psychopathy was assessed using the Hare Psychopathy Checklist–Revised (PCL-R; Hare, 2003). The PCL-R is an expert-administered rating scale based on details collected during a semistructured interview and an extensive collateral file review. Twenty PCL-R items are rated on a 3-point scale: 0 indicating no evidence, 1 indicating some evidence, and 2 indicating pervasive evidence in many domains of an individual’s life. Out of a maximum of 40 points, a score of 30 or higher is the recommended cutoff for an operational definition of psychopathy. The PCL-R also provides a dimensional assessment of psychopathic traits (Hare & Neumann, 2005). These have traditionally fallen into four facets nested under two major factors (Harpur, Hare, & Hakstian, 1989; Hare, 2003). Factor 1 consists of interpersonal traits (Facet 1), such as conning manipulation and grandiosity, and affective traits (Facet 2), such as callousness and shallow affect. Factor 2 consists of lifestyle traits (Facet 3), such as irresponsibility and impulsivity, and antisocial traits from childhood through adulthood (Facet 4). Many studies examining neural and physiological correlates of psychopathy have reported unique effects specific to each of the two overarching factors (e.g., Anderson et al., 2015; Iria & Barbosa, 2009; Juárez, Kiehl, & Calhoun, 2013; Maurer et al., 2015; Patrick et al., 1993; Philippi et al., 2015; Steele et al., 2016; Wolf et al., 2015). Thus, we examine effects related to PCL-R Total score as well as effects corresponding to the two-factor model. Diagnoses for other psychiatric disorders were based on criteria from the Structured Clinical Interview for DSM-IV-TR, Axis I disorders (SCID I/P; First, Spitzer, Gibbon, & Williams, 2002). Participants were not excluded for substance abuse or dependence, as substance use is a common feature of psychopathy (S. S. Smith & Newman, 1990). Substance use severity was accounted for using the number of substances for which participants met SCID criteria for dependence (cf. Cope et al., 2014; Harenski, Harenski, & Kiehl, 2014; Harenski, Harenski, Shane, & Kiehl, 2010; Maurer et al., 2016). Participants were excluded if they met SCID criteria for schizophrenia, bipolar, other psychosis, major depression, or anxiety disorder. We further assessed dimensional traits on depression and anxiety for their association with psychopathy scores. Dimensional depression was evaluated with the Beck Depression Inventory (Beck, Steer, & Brown, 1996); anxiety was measured using the State-Trait Anxiety Inventory (Spielberger, Gorsuch, Lushene, Vagg, & Jacobs, 1983). IQ estimates were calculated using the vocabulary and matrix reasoning subtests of the Wechsler Adult Intelligence Scale III (WAIS-III; Wechsler, 1997). The task employed during fMRI data collection was modified from a previous study reporting attention-dependent differences in ERP signals in a community sample with elevated psychopathic traits (Anderson & Stanford, 2012). The task requires responding to images that are either emotionally evocative or nonemotional (low valence). The stimuli were chosen from the International Affective Picture System (IAPS; Lang, Öhman, & Vaitl, 1988). Two runs were carried out with each participant. During the first run (implicit, alternative-focused condition), each participant was instructed to identify whether each picture takes place indoors or outdoors using a forced-choice button-press with the first and second fingers on their right hand. During the second run (explicit, emotion-focused condition), each participant was instructed to attend to any potential emotional content of the picture and classify each picture as emotional or nonemotional, again with forced-choice button-presses. Implicit and explicit runs were carried out within subjects, with the implicit condition occurring first, intended as a naïve baseline condition, to limit potential carryover effects of objective salience of emotional content (cf. Skelly & Decety, 2012). In both runs, there were equal numbers of indoor and outdoor stimuli and equal numbers of emotional and nonemotional pictures (as categorized by normed IAPS ratings). Emotional pictures were exclusively negative-valence stimuli depicting a mixture of facial expressions, threat-related images, sad scenes, harm, and some disgusting scenes (Valence M = 2.5, SD = .82; Arousal M = 5.9, SD = .82). Valences ranged from mild to extreme values in order to provide similar task difficulty as distinguishing indoor/outdoor images. Neutral pictures were chosen to centralize valence and minimize arousal (Valence M = 5.03, SD = .63; Arousal M = 3.4, SD = .65). Different sets of images were used for the implicit and explicit conditions, which were matched for valence and arousal. All IAPS slide numbers are presented below.1 Pictures requiring responses were interspersed among more frequent unidentifiable scrambled images, such that a response was required on only 20% percent of trials (48 response targets among 192 scrambled images per run). Pictures remained on the screen for 400 milliseconds and were replaced with a fixation cross after each trial. The total time for each run was 6 minutes, 18 seconds. Participants were instructed to keep their eyes focused on the center of the screen in order to minimize eye movements. The task was designed such that four planned contrasts could discriminate between specific cognitive aspects of emotional processing and attention. (1) Emotion implicit versus neutral implicit: Emotional pictures in the implicit condition contrasted against nonemotional pictures in the implicit condition exhibits brain activity specific to the processing of emotional content in the pictures when attention is otherwise occupied (by focusing on nonemotional features). (2) Emotion explicit versus neutral explicit: Emotional pictures during the explicit condition contrasted against nonemotional pictures in the explicit condition exhibits brain activity related to the processing of emotional content in the pictures while attention is explicitly devoted to discriminating emotional features. (3) Emotion explicit versus emotion implicit: Emotional pictures in the explicit condition contrasted with emotional pictures in the implicit condition exhibits brain activity specific to attention for emotional content, when emotional content is present (i.e., attention-facilitated response to emotional content). (4) Neutral explicit versus neutral implicit: Neutral pictures in the explicit condition contrasted with neutral pictures in the implicit condition exhibits brain activity related to vigilance for emotional content, in the absence of emotional stimuli (i.e., attention-dependent vigilance for emotion, during nonemotional pictures). Several a priori regions of interest (ROIs) were selected to examine brain activity involved in emotional processing and attention. Emotion-related ROIs were identified from meta-analyses of brain areas activated during emotional processing and included the amygdala, medial prefrontal cortex, ACC, inferior frontal, and anterior insular regions (Lindquist, Wager, Kober, Bliss-Moreau, & Barrett, 2012; Phan, Wager, Taylor, & Liberzon, 2002; Vytal & Hamann, 2010). For visually presented stimuli, the occipito-temporal visual stream exhibits strong emotion-dependent augmentation of activity in the cuneus, and Brodmann areas (BA) 18 and 19 (see also Pessoa & Ungerleider, 2004). The ACC plays an integrative role in cognitive/emotional processes (Bush et al., 2000; Etkin et al., 2011), while the subgenual division of the ACC (BA 25) is prominently activated during negative emotional experiences (Shackman et al., 2011).These emotional processing regions substantially overlap with brain areas identified in the salience network (Seeley et al., 2007). To account more broadly for mechanisms of attention, we examined components of dorsal and ventral attention networks as well as brain regions with regulatory executive roles in mediating these networks. The dorsal attention network comprises dorsal frontal regions around the frontal eye fields and middle frontal gyrus and dorsal parietal regions including the superior parietal lobule (Corbetta & Shulman, 2002; Miller & Cohen, 2001; Petersen & Posner, 2012, Vossel et al., 2014). The ventral attention network includes inferior frontal gyrus and areas surrounding the temporoparietal junction including angular gyrus and inferior parietal lobule (Corbetta & Shulman, 2002; Vossel et al., 2014). These networks are also mediated by influences from the ACC and insula (Fichtenholtz et al., 2004; Petersen & Posner, 2012). Paralleling their role in emotional processing, visual attention paradigms elicit attention-dependent augmentation of activity in occipital visual processing regions independently of emotional engagement (Kastner & Ungerleider, 2001). Describing ROIs selected for their roles in emotional processing and attention, it should be clear that these roles are not mutually exclusive. These processes involve brain regions that cooperate to produce phenomena that we are familiar with as emotional salience and attention. For computational purposes, ROIs were defined by the anatomical boundaries of brain areas contributing to the networks described above, made available in the Wake Forest University PickAtlas toolbox (Maldjian, Laurienti, Kraft, & Burdette, 2003). We adhered to the automated anatomical labels (AAL), and Brodmann areas where appropriate (e.g., subgenual cingulate). Table 2 provides a list of these ROIs. Figure 1 provides a visual representation of the ROIs, with numeric identifiers cross-referenced with Table 2. Since their network membership and functional roles are not unitary, regions are organized simply by gross anatomical divisions rather than by network. Functional MRI data were acquired on site at the prison facility, using the Mind Research Network’s Mobile Siemens Avanto 1.5 Tesla scanner with advanced SQ gradient engine. Echo-planar Imaging sequence parameters are as follows: TR = 2,000 ms, TE = 39 ms, FA = 70°, FOV = 24 × 24 cm, 64 × 64 matrix, 3.75 × 3.75 mm in plane resolution, slice thickness = 4 mm, 1 mm gap, with 27 slices. Data were processed with the SPM software in MATLAB (MathWorks Inc., Sherborn, MA, USA). During data collection, head motion was limited by custom padding that interfaces with the head coil. Participants with motion greater than 2 standard deviations from the mean (>2-mm translation, or 1.5° rotation) were excluded from analysis. Head motion is evaluated using INRIalign (Freire & Mangin, 2001; Freire, Roche, & Mangin, 2002). Motion estimates were included as covariates in the statistical models. Data were spatially normalized into the standard Montreal Neurological Institute (MNI) space and resampled to 3 × 3 × 3 mm. Data were spatially smoothed with an 8 mm full width at half-maximum Gaussian kernel. Independent component analysis (ICA) was employed to isolate and remove signal artifacts (e.g., signal originating in the ventricular spaces). A total of 25 components were estimated at the group level using the Group ICA of fMRI Toolbox (GIFT; http://mialab.mrn.org/softare/gift/). Two components comprised signal originating in the ventricles, and variance from these sources was removed at the individual subject level using the remove components function in GIFT (Calhoun & Adali, 2012; Calhoun, Adali, Pearlson, & Pekar, 2001). All subsequent GLM analyses were run using the corrected individual data. Task-related BOLD signal was further isolated by examining the spectral density of task events and their related power. We applied a band pass filter (.017 Hz–.187 Hz) to capture the task-related signal. Event-related responses were modeled using the SPM default two-gamma hemodynamic response function as well as a temporal derivative to account for small variations in peak latency. First-level analyses calculated amplitude differences within subjects, resulting from contrasts of interest described above. To reduce the impact of spatially varying hemodynamic delays as well as delays due to slice timing, the amplitude of the hemodynamic response was calculated using both the nonderivative and derivative hemodynamic response terms (Calhoun, Kiehl, Liddle, & Pearlson, 2004). Second-level analysis examined associations between these contrast estimates and scores on PCL-R factors and covariates (age, IQ, and substance use severity). Main effects (i.e., ignoring the effect of psychopathic traits) for each of the four contrasts described above were examined using one-sample t tests in SPM to highlight overall regions of activation for each condition. Stringent whole-brain-corrected thresholds were first applied to separate large contiguous clusters of BOLD signal into smaller, anatomically localized regions with discrete peaks of activation. Less stringent thresholds were then applied in succession in order to identify additional, overlapping clusters not surviving the most stringent thresholds, but which remained significant at lower whole-brain-corrected thresholds. All main effects presented herein are whole-brain corrected for false discovery rate (FDR). Each contrast was further evaluated for linear relationships with psychopathic traits in the a priori ROIs. All effects were small-volume corrected (FDR) within each anatomically-defined ROI. Effects related to PCL-R total scores (Model 1) were examined separately from PCL-R factor scores (Models 2, 3, & 4). All models also included age, IQ, and substance use severity as covariates. When examining effects related to PCL-R factor scores, care was taken to account for high correlations between Factor 1 and Factor 2 (r = .6). Therefore, separate models were examined: Models 2 and 3 included only the PCL-R factor score of interest (Factor 1 or Factor 2) along with said covariates; Model 4 included both PCL-R factors to account for unique effects of the individual factors, holding the other factor constant. Seven participants did not have sufficient data to score Factor 2 independently (due to item-level omissions at the discretion of PCL-R scorers); thus, analyses incorporating Factor 2 (Models 3 and 4) are restricted to 113 participants, while all other models use 120 participants, including the main effects, which ignore psychopathic traits. On average, participants categorized emotion/neutral photos more quickly, (M = 834 ms, SD = 94.62), t(119) = 5.01, p < .01, than the indoor/outdoor classifications (M = 864.92 ms, SD = 106.42). Reaction times were not significantly related to PCL-R total score or factor scores for either emotion/neutral classifications (all rs < |.04|; ps > .70) or indoor/outdoor classifications (all rs < |.2|; ps > .15). In terms of response choices for each forced-choice categorization, participants responses were generally accurate, matching their categorization of indoor/outdoor and emotion/neutral photos with the preestablished category (indoor/outdoor percent accuracy: M = 0.72, SD = 0.10; emotion/neutral classification accuracy: M = 0.74, SD = 0.10). Some variability is expected in these categorizations, as some stimuli are intentionally ambiguous. PCL-R scores were not related to the number of indoor or outdoor choices (all rs < |.1|; ps > .30). Regarding emotional/neutral categorizations, all participants exhibited some degree of neutral bias for categorizing emotional images. That is, all participants categorized some ostensibly emotional images as nonemotional (mode = 3; median = 5), and virtually zero (<1 on average) ostensibly neutral images were categorized as emotional. There was a trend for response style to be associated with PCL-R scores. The number of emotional slides labelled neutral by participants was significantly related to PCL-R Factor 1 scores (r = .19; p < .05); however, after controlling for covariates used in regression models (Age, IQ, Substance use severity), this relationship was not significant. Major depression and anxiety were used as exclusionary criteria; however, we also evaluated dimensional traits of self-reported depression and anxiety using the STAI and BDI. There were no significant associations between depression or state/trait anxiety measures (all rs < ± .15; ps > .10) and PCL-R scores (Total, Factor 1, or Factor 2). Inclusion of these measures in regression models did not impact results in substantial or meaningful ways, and they have been omitted for parsimony. For each of the four contrasts examined in this study, we first present main effects across all participants, ignoring the influence of psychopathic traits. These are followed by the significant linear relationships with PCL-R scores for these contrasts within a priori ROIs, accounting for covariates. Tables and figures provide a full account of these effects including peak coordinates, t values, and FDR-corrected p values for each contrast. Figures showing a representative selection of psychopathy-related effects (provided in full in the tables) are accompanied by plots of the linear trends for contrast estimates by PCL-R scores. These plots also include trend lines for each condition alone, versus a mean baseline derived from all events (time) not otherwise modeled in the task. Peak coordinates identified in the analyses are identified by labels provided from the Wake Forest PickAtlas. Main effects clusters are whole-brain corrected and are not limited to ROIs. This contrast produced significant activation in bilateral amygdala, lateral prefrontal cortex, inferior frontal gyrus, medial prefrontal cortex, and strong activation in the occipito-temporal visual processing stream. Clusters are pictured in Fig. 2, and peaks with specific labels are identified in Table 3. PCL-R total score showed significant negative associations with activity in ROIs within the visual stream including the cuneus, middle occipital gyrus, and inferior occipital gyrus. PCL-R Factor 1 was similarly negatively correlated with signal in these areas (see Fig. 3). Factor 2 exhibited positive associations with response in the amygdala, subgenual cingulate, medial prefrontal and ventral lateral frontal cortex (see Fig. 3). Peak coordinates and labels are provided in Table 4. This contrast produced significant activation in ventrolateral prefrontal cortex, medial prefrontal cortex (BA 9), ACC (BA 32), the temporoparietal junction, and the superior frontal cortex. Clusters are pictured in Fig. 4, and peaks are identified in Table 5. PCL-R total scores were positively associated with signal in the ventromedial frontal cortex, superior frontal cortex, insula, and occipital areas. These effects were similar for both Factor 1 and Factor 2 associations. Factor 2, however, showed a unique negative association with signal in the left amygdala for this contrast. BOLD signal associations with psychopathy scores were mostly left lateralized. Peak coordinates and labels are provided in Table 6. Effects are shown in Figure 5. This contrast produced activity in the ventrolateral prefrontal cortex, extending through medial prefrontal and dorsal prefrontal cortex including frontopolar regions (BA 10), the ACC (BA 32 and 24), and superior frontal cortex (BA 8 and 9). There was also significant activation in the posterior cingulate and inferior parietal lobule. Clusters are pictured in Fig. 6, and peaks are identified in Table 7. It is noteworthy here that the main effects for the reverse contrast, representing brain areas more active during implicit emotional processing compared to explicit processing revealed no significant activation at the thresholds applied in this report. PCL-R total score and Factor 2 had no significant associations with activity in any of the ROIs for this contrast. Factor 1 showed positive associations with activity in the angular gyrus and occipital regions. Peak coordinates and labels are provided in Table 8. Effects are shown in Fig. 7. This contrast produced widespread activity in the visual processing stream including the fusiform and lingual gyri, extending through the superior temporal gyrus, insula, and amygdala. Other significant activity included the superior parietal areas, superior frontal areas, anterior cingulate, and ventromedial prefrontal cortex. Clusters are pictured in Fig. 8, and peaks are identified in Table 9. PCL-R total score was negatively related to activity in the middle occipital region. Factor 1 showed stronger negative associations throughout the cuneus, and middle-inferior occipital cortex. Factor 2 showed positive associations with activity in the amygdala. Peak coordinates and labels are provided in Table 10. Effects are shown in Figure 9. This study was designed to evaluate functional differences in neural circuits that may be responsible for previously reported attention-dependent variation in emotional processing in psychopathy. Our findings reveal many psychopathy-related differences illustrated by contrasts designed to isolate specific elements of these emotion-attention interactions. When evaluating effects of emotional content (emotion vs. neutral contrasts), psychopathy-related differences varied as a function of attentional focus (implicit/explicit conditions). When evaluating effects of attention (explicit vs. implicit contrasts), psychopathy-related differences also varied by the presence or absence of emotional content. Furthermore, many of these effects were isolated to features of psychopathy represented by factor scores on the PCL-R—an increasingly common theme in reports examining neural correlates of psychopathy (e.g., Anderson et al., 2015). These effects are discussed here, again organized by the four contrasts designed to highlight separable aspects of attention to emotional features. On average, participants were faster to categorize emotional/neutral photographs than they were at making indoor/outdoor judgments. These effects were quite small (30 ms) and were distributed evenly among participants (i.e., they did not vary as a function of PCL-R scores). It is fair to suspect that participants found it slightly more challenging to identify indoor/outdoor features of the stimuli compared with identifying the emotional content. An alternative explanation is that these differences might be expected because of the selective importance endowed by stimuli with emotional significance yielding faster responses (Bradley et al., 2001; Öhman et al., 2001). The approximately equivalent accuracy across task conditions suggests that any differences in task difficulty did not impact accuracy, and may favor interpretations based on motivational forces. Still, interpretation of all results should bear these differences in mind. Regarding explicit categorization of emotional features, all participants’ responses (regardless of psychopathy) represented a somewhat “nonemotional” bias in response style, categorizing a number of emotional images as nonemotional. There was a trend for participants with higher PCL-R Factor 1 scores to label fewer stimuli as emotional. However, this trend did not persist when holding other covariates constant. When we evaluated models calculating parameters for BOLD signal based on participant categorization (emotional/neutral) rather than the normed values (an exploratory analysis), this did not greatly alter the effects reported here. Main effects and correlations with PCL-R and factor scores evinced the same patterns of signal, with t values that varied in a manner consistent with reduced power (fewer events) in the emotion + explicit condition. Furthermore, there is a trade-off in modeling events in this way. During the implicit condition, the only reasonable way to categorize emotional and non-emotional stimuli is by their published normed valences. In order to maintain consistency in modeling strategy across the explicit and implicit conditions, we favored a uniform approach for categorizing events. Importantly, the intended task manipulation was not dependent upon one’s “correct” classification of each stimulus. Rather, it was designed to attune participants’ attention to emotional qualities of the stimuli, regardless of the individual response-styles used to make a discreet categorization. The forced-choice categorization ensures compliance with the attention manipulation despite variable correspondence with a somewhat artificial dichotomy. This contrast isolates brain activity resulting from the presence of emotional content when attention is engaged with nonemotional features. It captures activity related to the automatic/implicit processing of emotional content. The main effects for this contrast demonstrate well-established expectations for processing emotional content in visual tasks, including activation of the amygdala, ventrolateral and medial prefrontal cortex, and emotion-dependent augmentation in visual processing areas extending rostrally from the primary visual cortex through the occipito-temporal visual stream. As expected, emotional content potentiated activity in these visual processing regions. This augmented activity is understood to be the result of feedback from the amygdala and components of fronto-parietal attention networks (Armony & Dolan, 2002; Taylor & Fragopanagos, 2005; Vuilleumier, 2005). This kind of amplified activity is thought to be a primary mechanism governing facilitated processing afforded by basic mechanisms of attention (see Hillyard, Vogel, & Luck, 1998; Kastner & Ungerleider, 2001; Ungerleider, 2000). For individuals with psychopathy, this automatic emotion-dependent facilitation is expected to be compromised, when attention is otherwise engaged. Indeed, features of psychopathy were associated with relatively reduced activity in visual processing regions, linearly related to PCL-R total and Factor 1 scores (emotional/interpersonal features). In other words, high scorers on these measures (reflecting the core emotional deficits central to psychopathy) fail to benefit from the augmented activity in visual cortex that ordinarily accompanies the processing of emotion-laden stimuli. This relative attenuation of emotion-dependent amplification in visual processing areas is conspicuously not paired with any apparent reductions in amygdala activity. That is, the amygdala activity that is apparent in the main effects for this contrast does not vary as a function of Factor 1 scores on the PCL-R. This is true even when controlling for variance in PCL-R Factor 2. We are forced, then, to consider other potential sources for this relative reduction. This may include compromised feedback between the amygdala and visual cortex; however, this hypothesis remains untested here. Prior studies, however, have indicated abnormal structural and functional connectivity between the amygdala and many other remote brain areas (Yoder, Porges, & Decety, 2015; Motzkin, Newman, Kiehl, & Koenigs, 2011; Wolf et al., 2015). It is enough to say that our data suggest, during passive engagement with emotional visual stimuli, the attenuating effect of high Factor 1 scores on neural representations of emotional content is apparent in occipital visual processing areas, and this supports notions of early-stage interference with intrinsic mechanisms of salience detection. Factor 2 elements of the PCL-R (impulsive/antisocial features) were positively associated with activity in the amygdala, orbitofrontal cortex, and subgenual cingulate cortex. These regions are prominently implicated in response to emotional stimuli (Lindquist et al., 2012; Phan et al., 2002; Vytal et al., 2010), and the subgenual cingulate is particularly important in governing negative affective states (Shackman et al., 2011; Vogt, 2005). As such, Factor 2 scores, considered apart from Factor 1, appear to be related to a hypersensitivity of these brain areas to the emotional stimuli in this contrast, despite attention being devoted to nonemotional features of the photographic stimuli. Factor 2 scores on the PCL-R account for disinhibited and antisocial behavior. It is reasonable to interpret this effect as capturing a relationship consistent with findings of hyperresponsivity to threat among those with impulsive externalizing disorders per se (e.g., Coccaro, McClosky, Fitzgerald, & Phan, 2007; Meyer-Lindenberg et al., 2006; Sterzer, Stadler, Krebs, Kleinschmidt, & Poustka, 2005). To be sure, this finding does not conflict with an expectation of reduced emotional responsiveness typically attributed to individuals with psychopathy. Factor 2 scores, by themselves, are not constitutive of psychopathy. Rather, this effect reinforces a model ascribing particular sensitivity to threatening stimuli among those exhibiting high levels of antisocial traits, unaccompanied by the emotional features that differentiate individuals with psychopathy from other highly antisocial individuals (see also Hyde et al., 2014). This contrast isolates brain activity dependent on emotional content when attention is explicitly directed to emotional features of the photos. It thereby captures emotion-dependent brain activity that is specifically apparent when attention is attuned to emotional content. Main effects for this contrast exhibit activity in ventrolateral prefrontal cortex, rostromedial prefrontal cortex including the rostral cingulate cortex extending into dorsal-medial prefrontal areas, and also the temporoparietal junction. The rostromedial prefrontal cortex features prominently in tasks involving sustained attention, and the ventrolateral prefrontal cortex and temporoparietal junction are prominently implicated the capture of attention by salient features of the environment (Frank & Sabatinelli, 2012; Vossel et al., 2014). Attention-based models of psychopathy suggest that this explicit focus of attention should eliminate some of the psychopathy-related differences in emotional processing. The current results demonstrate differences that are still apparent during this contrast and suggest specific neuroanatomical substrates for attention-dependent differences in emotional processing related to psychopathy. Psychopathy-related effects prominently feature elevated emotional-content-dependent activity in the medial prefrontal cortex, insula, and middle occipital gyrus. The augmented activity in these regions was significantly associated with PCL-R total score, Factor 1, and Factor 2. The medial prefrontal cortex is particularly important in higher-order executive processes contributing to emotion perception, evaluation, and control (Ochsner, Silvers, & Buhle, 2012). Likewise, the insula is important in evaluative processes that modulate the distribution of attention to salient features of the environment (Menon & Uddin, 2010). Relatively elevated activity in these regions may suggest additional or alternative cognitive resources being devoted to the explicit assessment of emotional content or application of emotion-related schema for attribution and categorization of images. Insomuch as psychopathy scores were modestly associated with reduced accuracy in categorizing emotional and nonemotional slides, these findings may align with an interpretation requiring increased cognitive resources there to perform this task. Further, the Factor 1-related deficiencies in emotion-dependent visual processing augmentation are no longer apparent in this contrast, evidently because attention is explicitly devoted to emotional features. This suggests a relative upregulation in this area as a function of explicit attention to emotion—an effect which can be directly observed in contrasts that compare explicit and implicit conditions (discussed further below). Factor 2 scores alone were associated with relatively lower signal in the left amygdala for this contrast. Insomuch as amygdala activity may be lateralized, left amygdala activity has been associated with explicit/conscious evaluation of emotion, while right amygdala has been associated with unconscious/implicit perception of emotional information (Morris, Öhman, & Dolan, 1998). The finding of reduced left amygdala signal indicates that those scoring high on Factor 2 exhibit smaller differences in activity between neutral and emotional stimuli, when being generally vigilant for emotional content. In other words, for those scoring high on Factor 2, the actual presence of emotional content makes a relatively smaller difference in left amygdala activity when vigilance for emotional content is generally high under both conditions of the contrast (both explicit conditions). These findings are corroborated when evaluating effects apparent during only neutral (non-emotional) images, discussed below. Again, the isolation of this effect to Factor 2 suggests that this effect is limited to more general antisocial/externalizing features, rather than psychopathy per se. This contrast isolates activity associated with the mobilization of attention for emotional content, while viewing emotional pictures. It should not be surprising that the main effects for this contrast exhibit brain areas that overlap substantially with those activated for the emotion explicit versus neutral explicit contrast. The emotion explicit condition is similarly involved in both contrasts, so we can deduce that the baseline comparison features of these contrasts (emotion implicit and neutral explicit) are remarkably similar across participants as well. That is, being actively vigilant for emotional content (mobilizing attention for evaluating emotion) increases signal in many of the same brain regions that are involved in the implicit processing of emotion content (see also Ochsner et al., 2009). Unique features for this contrast are attributable to the top-down focus of attention on emotional content, and they include the mid/dorsal cingulate (BA 24) and the posterior cingulate. In network models of attention, the dorsal ACC has been described as a moderator between the dorsal and ventral fronto-parietal attention networks, and the posterior cingulate is strongly implicated in emotional target detection (Fichtenholtz et al., 2004). As noted in the results, there is no evidence for increased activity attributable to implicit processing of emotional stimuli when compared directly with explicit processing of emotional content, across subjects. This does not mean that implicit processing of emotional content does not occur (as evinced by the emotion implicit vs. neutral implicit contrast). It only suggests that there is no apparent facilitation of BOLD signal attributable to implicit processing that is not also apparent during explicit processing of emotional stimuli, across all subjects regardless of psychopathy. Psychopathy-related effects for this contrast were only significant for Factor 1. This suggests that strictly limited attention-dependent differences in processing emotionally laden stimuli are most closely associated with the emotional/interpersonal features of psychopathy. These effects showed relatively greater activation in the angular gyrus and portions of the occipital visual system. Considered together with the effects previously described for implicit and explicit emotional processing, we may consider these attention-related effects to be an exhibition of certain neuroanatomical mechanisms by which activity in the visual processing areas is upregulated for those scoring high on Factor 1. The effects in the angular gyrus suggest an influence of the ventral attention network over this attention-dependent upregulation. This contrast isolates activity associated with attention to the emotional quality of images, only during neutral (low valence) pictures. The effects here represent a kind of vigilance for emotional content elicited by instructions to categorize images as emotional or non-emotional. It also removes any potential influence from the simple impact of actually viewing emotionally salient content (bottom-up processes), which deploys cognitive resources and attention through mechanisms represented above. The main effects for the present contrast show heightened activation in the amygdala, fronto-anterior insula, and occipito-temporal visual processing stream reminiscent of activity during the implicit processing of emotional content. In contrast, however, these effects are coupled with activation in the ventromedial prefrontal cortex, rostral ACC, superior temporal gyrus and insula, as well as portions of the dorsal attention network including superior frontal gyrus and superior parietal cortex. This contrast demonstrates that vigilance for emotional content is sufficient to induce activity in portions of the salience network and emotional processing regions, but also requires neural resources in higher order cognitive control regions (see Vossel et al., 2014). Psychopathy-related effects again reveal important differentiation between the contributions of the two factors of the PCL-R. Factor 1 was specifically related to relatively reduced activation of the occipital visual stream, and PCL-R total score only partially captures this same effect. So despite high scorers on Factor 1 showing relatively elevated attention-mediated visual augmentation when emotional features are present (emotion explicit vs. emotion implicit), vigilance for emotion per se (during low-valence images) is not sufficient to exhibit this augmentation for those scoring high on Factor 1. It seems that Factor 1 effects represent a heightened attention-mediated response to the presence of emotional content, akin to emotional target recognition. This is not equivalent to any psychopathy-related effects in basic emotional priming in visual attention; in fact, activity remains relatively attenuated with respect to Factor 1 associations. Factor 2 again exhibits positive associations with activity in the left amygdala. Paired with other Factor 2-specific effects in this study, this indicates that this abnormal amygdala response is not limited to conditions involving emotional (high valence) stimuli, but is also apparent during vigilance for emotional content, while evaluating nonemotional images. To help clarify this, Factor 2 effects for the emotion explicit versus neutral explicit contrast exhibited relatively smaller differences in left amygdala signal. That seems likely to be driven by relatively stronger amygdala activity during the neutral explicit condition (the baseline comparison for that contrast), as indicated by the relatively elevated signal there for the present contrast. Again, these effects are specific to Factor 2 alone, rather than to psychopathy in general or the distinguishing emotional features of psychopathy. They remain consistent with previous reports related to general antisociality and externalizing traits, as noted above (Coccaro et al., 2007; Hyde et al., 2014; Meyer-Lindenberg et al., 2006; Sterzer et al., 2005). The findings described here add to a growing body of literature demonstrating the importance of attentional mechanisms when considering the emotional deficits associated with psychopathic traits. Mechanisms of attention feature prominently in the response modulation model of psychopathy (e.g., Newman, 1998; Newman et al., 1997; Newman et al., 2010), as well as related attention bottleneck (Baskin-Sommers et al., 2011) and impaired integration (Hamilton et al., 2015) models of psychopathy. The research described here is intended to complement these models by manipulating discrete features of emotional processing and attention as they relate to automatic and goal-directed selection processes, and further by examining activity in specific brain areas that have been implicated in network models of attention that draw on these processes. Considering the complex nature of attention and its relationship with emotional processing, it will be important in future studies to continue expanding efforts to define mechanisms of attention more discretely, with increasing specificity. Critical among the findings described here, the individual factors contributing to overall psychopathy scores seem somewhat more sensitive to specific directional effects, and Factors 1 and 2, demonstrate unique associations in different brain areas for certain contrasts. The emotional-interpersonal features that distinguish psychopathy from more generic antisocial traits are associated with reductions in visual cortical activity that ordinarily represent heightened attention for emotional content. However, these effects are eliminated when there is an explicit focus on emotional content aided by apparent upregulation in medial prefrontal areas and the insula. Attention to emotional content is accompanied by heightened activity in the angular gyrus, which is unique to Factor 1 scores on the PCL-R. Still, the actual presence of emotional content is apparently important for this effect, as vigilance for emotional content during neutral pictures only exhibits the familiar Factor 1 dependent reductions in occipital regions. The impulsive-antisocial features of psychopathy, considered apart from emotional-interpersonal features, exhibit effects consistent with a relative hypersensitivity to emotional content during implicit conditions and hypervigilance for emotional content when isolating the effect of attention to the emotional quality of images. These effects are represented by elevated activity in bilateral amygdala, medial prefrontal cortex, and subgenual cingulate (for implicit emotional processing) and the left amygdala (for explicit attention to emotion among neutral images). Similar effects, interpreted as hypersensitivity to threat, for instance, have been reported elsewhere among externalizing populations (e.g., Coccaro et al., 2007; Meyer-Lindenberg et al., 2006; Sterzer et al., 2005). Overall, these findings reinforce the notion that psychopathic traits are associated with abnormalities in how the brain engages with emotional information in the environment. They further emphasize that more fundamental cognitive properties related to attention either support and maintain these abnormalities, or in some contexts fully account for them. These findings should be considered along with several limitations. First, as discussed in the methods, the task conditions were not counterbalanced. In order to partially limit the objective salience of emotionally evocative pictures during the implicit condition, the alternative-focus condition was always presented first in the sequential, within-subjects design. This introduces the possibility of order-related effects, such as habituation, interfering with the intended task manipulations, or possibly interacting with psychopathy-related effects. In our exploratory examination of order effects, we only found evidence for heightened activation in the second run (accompanying instructions to attend to the emotional features of the images). That is, no evidence for reduced activity from Run 1 to Run 2 survived thresholds applied in this study. The heightened activity accompanying attention to emotional content (apparent in the main effects for neutral explicit vs neutral implicit and emotion explicit vs. emotion implicit) are expected, thus we reserve confidence that our intended experimental manipulation across runs was successful. While it is evidently unlikely that these effects are interfered with by habituation, it does not rule out other potential nuisance effects that may accompany task order, including those that may interact with the presence of psychopathic traits. We also described a small but significant effect for differences in reaction times across task conditions. In the discussion above, we note possible sources for these differences, namely differential task difficulty or heightened perceptual-motor effects related to the natural salience of emotional content. These differences were small and not systematically related to psychopathy scores, so they are unlikely to bear a significant impact on the psychopathy-related effects reported here. Finally, the experimental design was established to isolate very discrete instances of attention and emotional processing as described by the four planned contrasts. This necessarily limits the value of higher order contrasts (e.g., a simple implicit vs. explicit contrast), as this would require collapsing across important manipulations in the study design (emotional and non-emotional slides). Further, analytic strategies aimed at collapsing across these levels essentially equate to interactions that are directionally ambiguous as calculated at the second level and are thus problematic to interpret. Moreover, they would provide an incomplete view of the psychopathy-related effects demonstrable with the planned contrasts presented above. The main effects demonstrate, for instance, that explicit attention to emotional content elicits brain activity that is differentiable from vigilance for emotional content (during low-valence/neutral images). We argue that it would obscure important effects to collapse across these conditions. Further, our task conditions were specifically designed to manipulate attention to emotional features of images without introducing novel extra-dimensional stimuli or complex cognitive demands that have sometimes been used to modify or interrupt emotional encoding in prior studies of attention and emotion (e.g., Pessoa & Ungerleider, 2004). Careful interpretation of these results will hopefully influence future designs that wish to examine, replicate, and extend these effects under varying conditions. In addition to these limitations, a great deal is left to be learned from these results. For instance, the immediate source of compromised emotion-dependent facilitation of occipito-temporal neural activity remains unclear. Several possibilities exist, including the potential failure of normal feedback from the amygdala; however, this will require additional separate analysis, examining measures of structural and functional connectivity directly. Furthermore, without longitudinal data, it would be impossible to fully explicate the etiology and developmental course of the effects described here. Other research has indeed supported the developmental importance of individual differences in attention and perception of emotion (see Dadds et al., 2012, 2006), and similar differential effects related to sub-features of psychopathy have been demonstrated in conduct-disordered children as well (Sebastian et al., 2012). Examining the present effects in children and adolescents with callous-unemotional traits would be a valuable step toward understanding their developmental course. Finally, this study has purposefully attempted to simplify the cognitive context of these effects to distinguish specifically between active and passive engagement with emotional stimuli. Certainly, more complex tasks (such as aversive conditioning or startle modulation) occur with additional cognitive demands, and thus our findings may not directly extend to other demonstrations of emotion/attention interactions in psychopathy. In conclusion, this study provides a fundamental context for understanding the neural processes that underlie attention-mediated differences in emotional processing among individuals with psychopathy. Future studies would benefit from considering the contextual impact of attention when designing tasks that investigate psychopathy-related differences in emotional processing. The present findings may further augment the specificity of hypotheses related to functional cognitive differences attributable to psychopathic traits. Emotion implicit: 3000, 3053, 3100, 3110, 3266, 6230, 7380, 9040, 9140, 9320, 9582, 9592, 1120, 2800, 5972, 6212, 9181, 9220, 9373, 9410, 9415, 9420, 9440, 9611. Neutral implicit: 2230, 2270, 2372, 2440, 2487, 2490, 5535, 7034, 7185, 7224, 7234, 7710, 1450, 2485, 2520, 2570, 2850, 2880, 5534, 7140, 7490, 7496, 7500, 7560. Emotion explicit: 3060, 3102, 3120, 3130, 3168, 6260, 7360, 9300, 9561, 9570, 9584, 9594, 1051, 2730, 2900, 5971, 9182, 9252, 9400, 9430, 9433, 9480, 9490, 9600. Neutral explicit: 2214, 2280, 2383, 2749, 2890, 5455, 7002, 7110, 7186, 7217, 7700, 9360, 1670, 2516, 2580, 2870, 5390, 5395, 5500, 5875, 7495, 7590, 7595, 9210. The authors thank Keith Harenski and Prashanth Nyalakanti for their assistance in data analysis. We also thank the Mind Research Network and the Wisconsin Department of Corrections for their cooperative efforts. This research was supported in part by grants from the National Institute of Mental Health: R01MH090169 (PI: Kosson), R01MH087525 (PI: Decety), F32MH098532 (PI: Anderson) and the National Institute on Drug Abuse: R01DA026505 (PI: Kiehl).